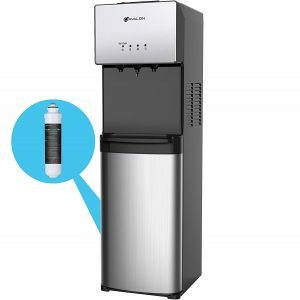 Avalon A5-Bottleless is a 2017 release high-end commercial level water cooler and dispenser with three convenient temperature settings of cold, room temperature and hot. It is a great quality sturdy and durable product with an innovative stainless steel cabinet. Avalon A5 is a rather popular and one of the better selling water coolers on Amazon.com with a rating of 4.2/5 stars out of 53 customer reviews on the day of this review. As a UL certified water dispenser, it meets the safety standards set out by UL. And the Energy Star certification simply means energy efficiency- it consumes less power being easy on your energy bills. You can also turn off the hot, room temp and cold water through the switches at the back. Cold water is crisp cold, hot is piping hot and the room temp is in between when you don’t need very hot or very cold water. The good thing about having this bottle-less unit is that you won’t have to keep buying bottles of water. With the self-cleaning ozone function, the water tank is cleaned, purified and sanitized with the ozone injection by a simple press, preventing the bacteria build-up over time. There is the built-in child security lock on the hot water spout to avoid any potential burning accidents. You’ll be able to see the push button spouts very clearly at night with the built-in nightlight that can be switched on through the rear of the unit. You’ll be notified with a light indicator flashing when it is time to replace the filter. Avalon A5BOTTLELESS weighs 44 pounds, has a 6 cubic feet capacity and measures 13 x 12 x 41 inches. You have about 9 inches of space below the three spouts and the water dispensing area measures roughly 12 x 3 x 10 inches. The cold water tank has a 3.6-liter capacity and the hot water tank has 1 liter. It is a freestanding -standalone water cooler that you can use in any part of your house or office and will fit in well with the decor. In the box you will get the water dispenser, NSF certified activated carbon filter, water line to attach to the source and the installation kit. You have the filter flushing adapter, 10 foot PE tubing and an adapter valve as part of the installation kit. The water will flow immediately when you press one of the temp buttons. It has a very efficient compressor that will help deliver very cold water at 47 degrees Fahrenheit and you won’t even need to put any ice cubes in your glass. With the hot water at up to 180 degrees, you can easily make a hot drink of coffee, tea or hot chocolate. The water that is taken out of the water source is filtered by the filter and distributed to the cold and hot water reservoirs. There will be no harmful bacteria, lead, chlorine or rust in your water. There is even an integrated leak detector that will keep track of the water leaking from the water source into the machine. 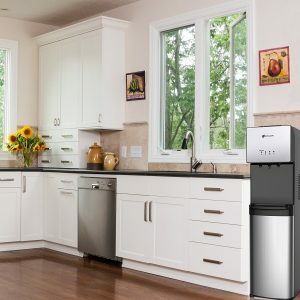 It is very easy to install as you simply connect the water cooler to your sink water line. The filter seal last for about 1500 gallons water or for around six months, then you’ll need to change it. Any spills or drips will be caught by the detachable drip tray that is located at the bottom of the water dispensing area. Avalon A5 runs very quietly and efficiently and you’ll never worry about running out of the water with this unit.